The route we took ( mostly up hill!) getting to Boadillia last year. It’s spring in Spain and flowers colour the landscape. 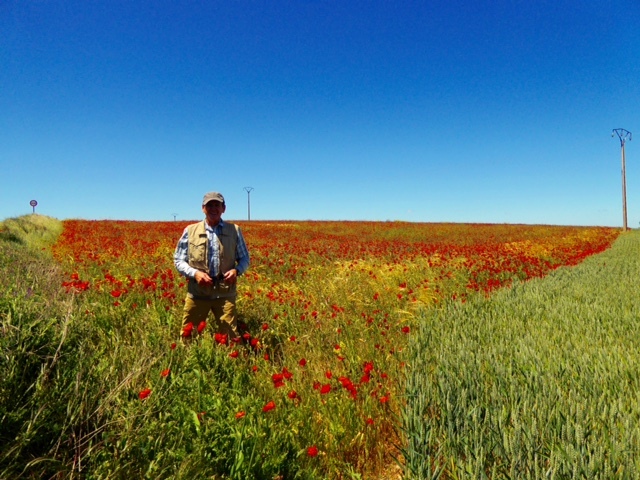 Rod in a field of poppies after his tumble down a hill to get the picture! 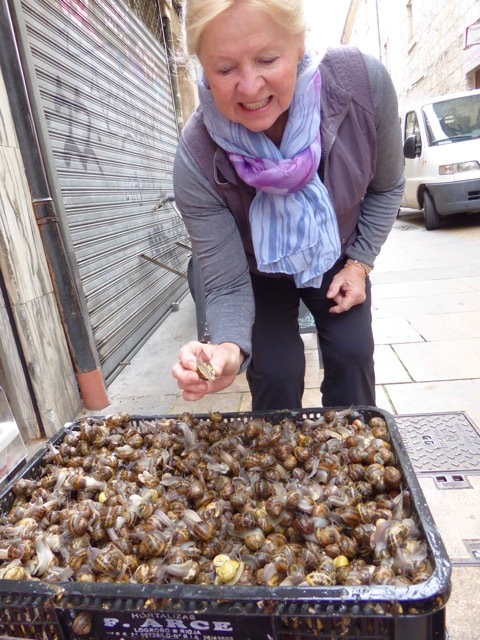 Delana found this unusual site in downtown Burgos, live snails ( caracol in Spanish) being sold by the kilo! Please excuse the fact that the photos above are not in a logical order….. There are electronic gremlins in this blog site and they seem to have their way! 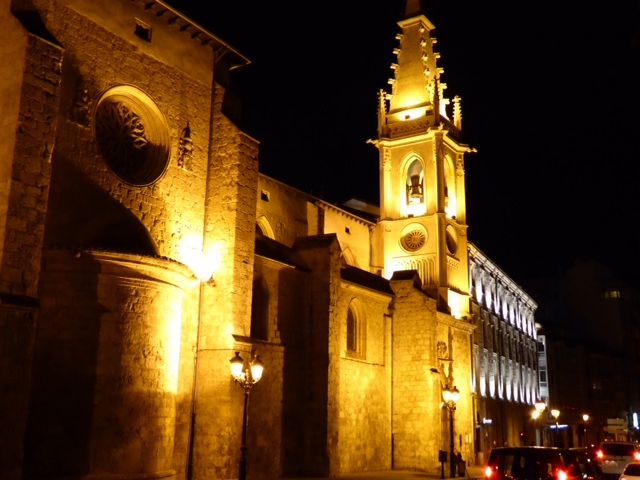 We enjoyed a lazy morning in Burgos as the vehicle taking us to our end point last year was not arriving until 1300. These relaxing few days have been a gift. 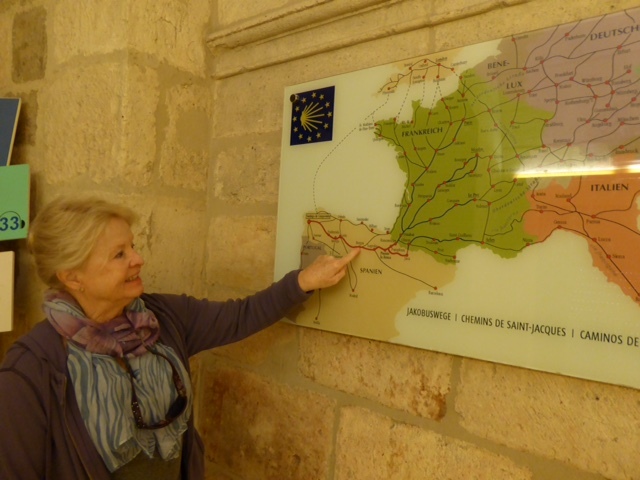 We are well rested and eager to resume our Camino trek. Yesterday Rod realized that some sewing of extra pockets for his rain jacket had been forgotten by 😔….? Anyhow, when we passed a wool shop in town that had sewing machines for sale, in Rod goes and asks the woman running the shop if she can sew his jacket. Although this is not what her shop is about, when we return an hour later, Rod’s jacket is altered perfectly and for a pittance. This is but one example of the kindness peregrinos receive on the Camino. 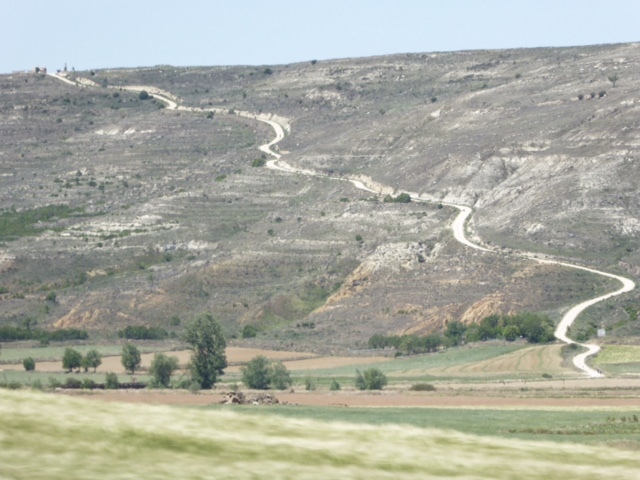 It was a lovely drive from Burgos back to Boadilla del Camino. The fields of wheat, oats and barley had had one harvest already and made a colourful quilt accented by large swaths of red poppies. At a photo stop amiably provided by our driver, Rod tumbled down a steep bank trying to get a photo of the poppies for Jill our “poppy friend”😊 Fortunately the photo was good and Rod is fine. On reaching Boadilla (90 min from Burgos) we headed off toward Fromista with a hefty tail wind. Much of today’s short walk was alongside the Canal de Castilla. This is a 207 km long waterway built in the 1800’s to transport the cereal crops of the region. It is now primarily used for irrigation in this arid land. Our path was rocky but flat, framed by yellow iris on the canal side and a floral bouquet of wild roses, poppies, wild pointilla and daisies on the other. A bonus of walking in springtime is the constant birdsong all around. We are comfortably ensconced in a small hotel in Fromista (pop, 822). 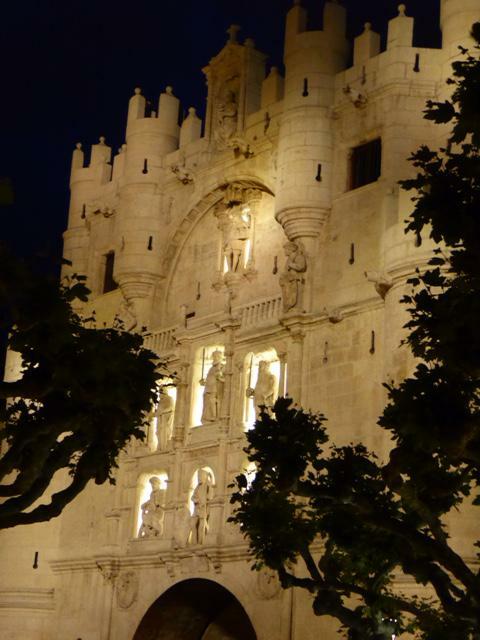 The town is a popular stop for pilgrims and is noted for the Romanesque church of St, Martin de Tours which is right outside our window. you are living the dream, complete with nature’s overture. thanks you for sharing! !